Holy Week heartbreak as iconic cathedral burns in a nation that has seen a rash of attacks on Catholic churches. 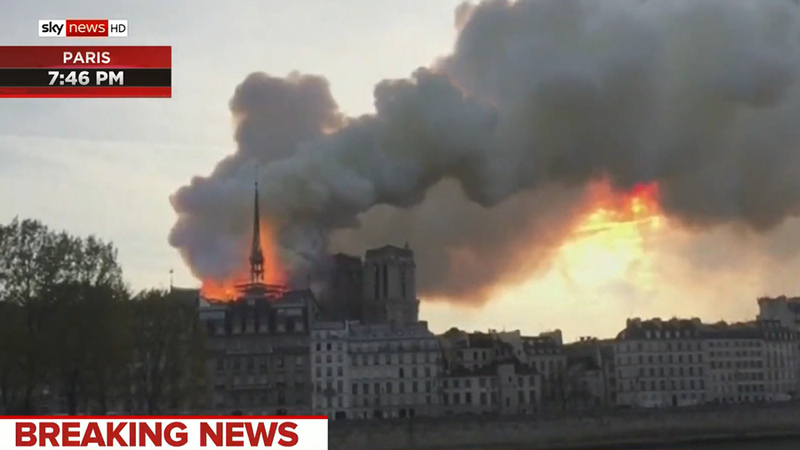 A “terrible fire” is leaving the famed, historic Notre Dame cathedral in Paris in ruins. French media is reporting the fire is believed to be related to renovations being undertaken at the structure. Terrorism is not immediately suspected. Curiously, Time magazine columnist Christopher J. Hale tweeted, “A Jesuit friend in Paris who works in #NotreDame told me the cathedral staff said the fire was deliberately set.” He qualified the assertion in a separate tweet, calling it a rumor. Hale then deleted his original tweet. It is unknown at this hour how many people were in Notre Dame when the fire broke out. No deaths have been reported. Notre Dame was built 850 years ago, and remains an active Catholic church. The cathedral gets 13 million visitors a year. The BBC reports that just last year the Catholic Church in France launched an urgent appeal for funds to save the cathedral, which was starting to crumble. Meaning, firefighters face a desperate, precarious battle save the historic marvel. Urgent prayers are needed. Although authorities are currently linking the fire to restoration work being done, there is reason to be suspicious. France has seen a series of attacks on Catholic churches since the start of the year. In mid-March, for example, the historic Church of St. Sulpice in Paris was set on fire. That was just one of a dozen Catholic churches attacked that week alone. The attacks sparked fears of a rise of anti-Catholic sentiment in the country. At this hour, amid Holy Week, France’s greatest symbol of the Catholic Church — one of the most iconic churches in all of Christendom — is burning to the ground.